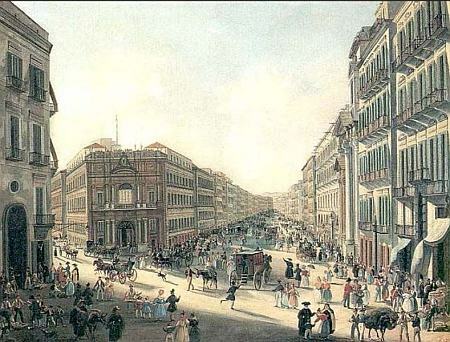 In 1845 the Congress of Italian Scientists met in Naples. Publisher Borel & Bompard published a guide to the city for the visitors, Napoli e sue vicinanze (Naples and her Environs). Among other features, the guide included the routes of all omnibus service in the city. Note the difference among various types of conveyances of similar design in early public transportation such as (omni)bus and tram. There is one overriding (hah!—nice one) difference: by definition, trams run on tracks whether or not they were drawn by horses in the very early days or steam or electricity (in Naples, steam trams came in 1880, then electric trams in 1899). There was, however, public transportation before that; many European large cities had omnibus ("for all") service as early as the mid-1820s. The omnibus was simply a city variation of the rural stage-coach. The painting (right) by Gaetano Gigante (1770-1840) shows just such a red coach. It has just turned onto via Toledo to head south towards the royal palace (not visible) in the distance. (The prominent sunlight building on the corner on the left is palazzo Doria d'Angri, one of the most historic buildings in the history of modern Italy. Garibaldi came out on that balcony in 1860 and proclaimed that Italy was now united.) The vehicle is enclosed, has large spoked wheels, and appears to be drawn by a team of two horses. There appears to be one coachman. There is an important difference between this coach and the rural stage-coach: here you got on from the back and there were two long benches inside facing each across a center aisle where you could also stand. Since we know when the artist died, and we know that these vehicles started to come into use in large European cities around 1820, we can say that this is pretty much the kind of conveyance that the visiting scientists climbed aboard to ride around Naples and see the sights. The service wasn't bad, either. There were three lines in the Naples of 1845. They were even color-coded for the illiterate. The "transit system" had a total of 25 cars, 21 of which (!) were used for the busy Line A; it went from the royal villa (now the Villa Comunale) in the west and proceeded east along via Chiaia (still named that) over towards the Royal Palace and then left onto the main drag, via Toledo (still that—now also called via Roma). That is, it would be coming towards you on the main street in the painting, passing through the artist's point of view and continuing up to what is now the National Museum where it turned right, finishing the run at the Albergo dei Poveri. Line B connected the square near the Maschio Angioino down at the port with the main courthouse in the inner city; it went up the same via Toledo but then turned right at Largo del Mercatello (today, piazza Dante, just behind the point of view in the painting), went through an arched passage still called Port'Alba and then along via dei Tribunali, the main street of the old historic center of Naples, all the way to palazzo Capuana, the Hall of Justice. Line C started the same as B, but went down along the coast to the old Carmine castle (some monument ruins are still standing) and turned up via dei Fossi (today's Corso Garibaldi) to the Stazione della Strada Ferrate [lit., station of the iron road—that is, the train station] the station of the first railway in Italy (opened 3 Oct 1839) that connected Naples with the Royal Palace at Portici. That was some nifty technology to be able to show off in 1845. Some of the ruins of the station are still visible near the first station of the Circumvesuviana (but they are jumbled up with a lot of other ruins—those from World War II, for example). Again, note the difference; these are not trams—which were a great improvement. These buses (also known as “horse-cars) were dragged along by horses or mules on the surface of the city roads, paved and unpaved. Later, tracks made a big difference; the low rolling resistance of metal wheels on iron or steel rails allowed the animals to haul a greater load for a given effort than the omnibus and gave a much smoother ride. 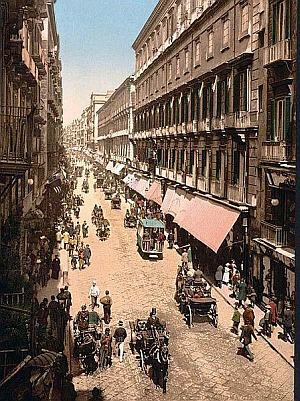 The first tram lines opened in Naples in 1875. After that, there were steam and then electric trams (late 1890s). I came across all of this while trying to put a date on this photo (right). First, the colorized version is deceptive. One is tempted to say '1900'—look at that splendid color! But there really is nothing 1900 about it. First, look at the clues: there is absolutely no motorized traffic, but that might not mean anything in 1900. (If you see this postcard, you will see exactly one car in it from around 1900.) I think the real clue here is the tram, except that it isn't a tram. It's a horse-car. There are no tracks. It's smaller—or at least lower—than the one in the Gigante painting, but it's a horse-car. (It isn't a steam driven vehicle, either; those started in Naples in 1888, but they were on tracks.) Even though you can't really see the horse in front, he's there. This is a sciaraballo, as they were called in Neapolitan—scaled down from the higher city stage-coaches of decades earlier. The term is, indeed, a local dialect version taken from the French "Char à bancs" (car with benches). Around 1863 some of these horse-cars started to convert to tracks. This street is via Toledo, one of the busiest streets in the city. If there are no tracks, this card cannot be as late as 1890. We also know that in the late 1870s the City Council called for proposals for a transit system. One of the plans submitted was by Lamont Young. The plan involved (1) steam locomotives for tunnels to be built beneath Montesanto and Posillipo; (2) Tramways—horse-drawn cars on tracks, and (3) the Omnibus—horse-drawn cars, but no tracks. The plan was rejected, but the idea of the horse-car, the trackless omnibus such as the one in this photo, was still thought to be useful. So I'll say 1870-75 on this.